Comfort food to its maximum gourmet elevation. 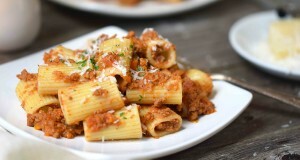 This bolognese sauce is cooked with milk, wine and real tomatoes; slowly simmered to perfection. Enjoy Tribute celebrates my love for food and life, sharing recipes made from scratch with ingredients your grandma would have used! I started a media productions company - check it out! be the first to know of new posts! get them straight to your inbox! don't worry, I don't sell your information or spam and you can unsubscribe at any time!